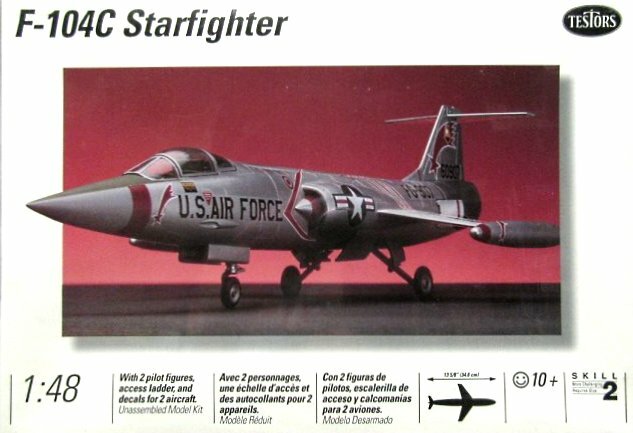 From my earliest model building days, I’ve always been drawn to the beautiful box art on model kits. A quick search turned up the above photo of the box art from a kit I built as a kid. This illustration captures all the excitement of modern naval technology. 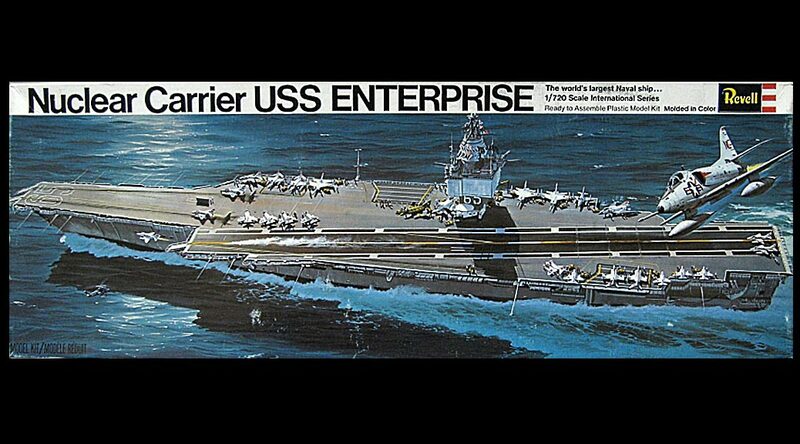 The Enterprise is a commanding presence, carving a frothy white wake in an ocean of gorgeous blue. An A4 Skyhawk streaks overhead, reminding us that this is no ordinary ship, but a mobile airfield. So powerful is the illustration, I instantly recognized it out of hundreds of photos in the search results, even though the model is long gone. Not all box art is created equal, and there’s obviously no relationship between the quality of the illustration and the quality of the kit itself. Some excellent kits come in poorly illustrated boxes, and vice-versa. Japanese kit manufacturers usually get it right on both counts, with well engineered kits in finely illustrated boxes. I find Tamiya’s box art to be exceptionally good. Not all types of kits get the same artistic treatment. For a long time, science fiction kits were the poor cousins of the box art world. AMT and MPC, which brought us subjects from Star Trek, Star Wars, Space: 1999 and other iconic sci-fi shows and films, always had cheap looking box art. MPC’s Eagle was a mess on all counts: one of the most inaccurately mastered kits ever produced, in a really ugly box! Things have improved for sci-fi modelers, now that we have premium science fiction kits from companies like Fine Molds and Fujimi. The Star Wars line from Fine Molds features top notch box art. I especially like the box art on the Y-Wing kit. And Fujimi’s Spinner from Blade Runner also comes in a nicely illustrated box. Some box art is so good, you could cut it out and frame it if not for the type that covers the illustration. And some of the top artists in the field, like Roy Cross, Jack Leynnwood, Kihachiro Ueda and Shigeo Koike, have had their box art republished in prints and books. Koike’s website at http://shigeokoike.com/en features some of the masterful work he’s done for Hasegawa and Fuji Heavy Industries. If you’ve never heard of any of these artists, it’s because they generally aren’t permitted to sign their names to their box art illustrations. The kit producer will argue that they want to promote the kit, not the artist, although I see no reason why they couldn’t do both. If we think of the model building experience as a journey, then the journey begins when walking into a hobby store and seeing a new kit, or spotting it online. An attractive package will naturally generate more sales, and marketing departments know full well the importance of capturing the prospective buyer’s imagination the first time he sets eyes on a new kit. It can make the difference between winning and losing the sale. The worst thing a kit manufacturer can do is have no box art at all. Anyone who’s ever bought a resin garage kit is familiar with the curiously anticlimactic experience of receiving their kit in the mail, unwrapping it, and being confronted with a plain cardboard box devoid of any graphics at all. Or a splotchy black and white photocopy stapled to the box, which is worse. Of course it would be asking a lot to expect a garage kit producer to be a gifted professional artist as well as a good mold maker. Garage outfits are usually one man operations, and few people are that multi-talented. What’s harder to excuse is mass producers of kits who make bad decisions when it comes to box art. Remember when Airfix offered kits in plastic bags? The only visible artwork was a tiny piece of folded cardboard stapled to the top of the bag! You had to really want the kit badly to stomach such cheap packaging. Even worse, you’d be left wondering if the unprotected parts would still fit together when you got the kit home. Without the protection of a cardboard box, parts could come off sprues and get damaged or lost. 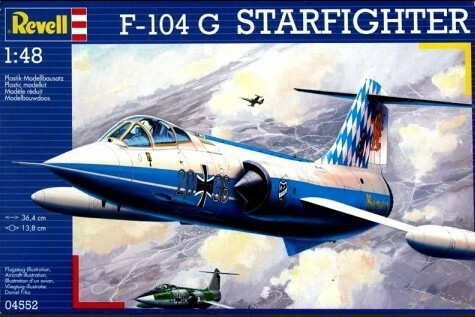 But then quality has never been a priority for Airfix. In the age of online shopping, one reason people still enjoy walking into a hobby store is because it’s like entering an art gallery full of illustrations of your favourite planes/cars/boats/spaceships. The poster-size box art on large kits beats squinting at tiny website photos hands down. Shrink-wrapped kits are even better, adding a glossy coating which makes colours pop (and reassures you that no pieces are missing). With few exceptions, kit producers prefer to use paintings of the “real thing” rather than photographs of the completed model for their box art. Paintings are better at generating interest for a potential buyer because they exploit his interest in the actual subject, which is the reason he’s buying the kit. And a painter can place the subject in a dynamic scene, whereas a photo of the completed kit will always look static and dull in comparison. It’s the same subject in the same scale, but the illustrated package is far more appealing. And being human, we assume that what looks good on the outside will transfer to the inside. So most people will prefer the Revell kit, other things being equal. If you have a closet full of old kit boxes and you’re about to move, you may be contemplating throwing them in the recycling. But instead, consider cutting out the front illustrations and keeping them. You can discard the rest of the box, and still have all that beautiful artwork when you arrive at your new place. The introduction of a new model kit based on a subject from a movie is an eagerly anticipated event for many hobbyists. I remember when MPC released its Millennium Falcon kit back in 1977, coinciding with the release of the first Star Wars movie. MPC’s marketing department was on the ball and capitalized on the movie’s success by being quick on the draw with the release of the kit. Not all kit releases are timed as perfectly as MPC’s Falcon release. The same subject was released by FineMolds nearly three decades later, in 2005. The FineMolds Falcon, although late to the game, was a dramatic improvement over the MPC kit. It featured the usual high level of accuracy and detail associated with the FineMolds brand, in correct 1:72 scale. The MPC kit did not even specify a scale, and Star Wars aficionados have enjoyed debating the scale of the kit since it was released. When I first heard about the FineMolds Falcon release, my first thought was, “Wow, it sure took them long enough.” But FineMolds actually did something very clever. The price differential between the two kits is considerable, even with a few decades’ worth of inflation factored in. The result is that they are not in direct competition with one another. The MPC kit was clearly aimed at kids and teens with little or no money. The FineMolds kit, on the other hand, was targeted at advanced modellers with generous budgets. The funny thing is, even though the markets for the two kits are distinct, the person buying them could quite often be one and the same. If you were a teen when Star Wars was released, and bought the MPC kit back then, there’s a good chance that you’d be willing to upgrade to the FineMolds version several decades later. My guess is that this is exactly what FineMolds planned. 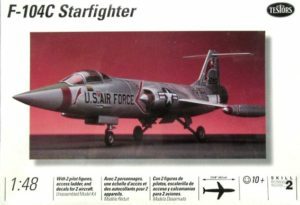 The FineMolds Falcon has been so successful that Revell is now re-releasing it under their Master Series label. It will still be manufactured in Japan by FineMolds but will have revised packaging and English instructions. It’s less clear what Bandai was thinking with their recent release of 1:72 models of the classic X-Wing and Y-Wing. Chances are, anyone who wanted a 1:72 scale kit of either of these subjects would have picked up the FineMolds version by now. Price, accuracy and quality for both brands are similar. There just isn’t that much difference between them. 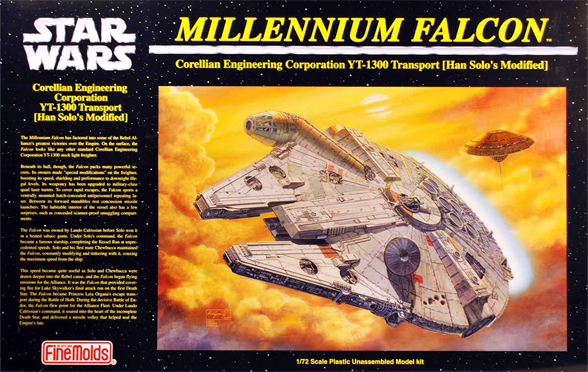 Bandai will also be releasing a 1:144 Millennium Falcon, which has been done before by FineMolds as well. How Bandai will be able to turn a profit on these “me too” products is a mystery. A much better move would have been to produce a 1:48 Y-Wing to complement the FineMolds 1:48 X-Wing. This would have filled an empty niche in the market. When Episode 7 of Star Wars comes out this December, a newly designed X-Wing will grace the screen. It looks good—smaller and sleeker—and can be glimpsed in the teaser trailer for the film. Fortunately, Bandai has made one good decision, which is to launch a kit of the new X-Wing just before Episode 7’s release in December. Unless the movie is a complete disaster, this kit will be a guaranteed cash cow. The new X-Wing will be followed by a kit of the new TIE Fighter, which looks like a lot like the classic TIE but with an inverted colour scheme. This kit should be popular as well.